Back in May Marvel proved with Captain America: Civil War it could skillfully juggle over a dozen major characters without sacrificing storytelling clarity and intelligence. 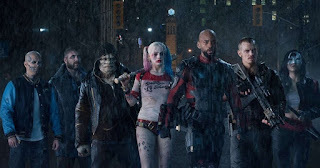 On the flip side, Suicide Squad - Warner Bros. third entry in its increasingly distressing DC Universe mega-franchise – fails miserably to coherently portray its leads’ journey on foot across a few city blocks. This is sadly becoming par for the course for the studio, who have this time assembled a fun, colorful, well-cast batch of antiheroes and tossed them into a tornado of sloppy, shapeless narrative chaos. Like Batman v Superman, this film is so desperate to set up future sequels and spin-offs it furiously forsakes its own enjoyment and overall worth. There’s a kernel of splashy Dirty Dozen-esque genius to the Suicide Squad concept – wherein a taskforce of homicidal marquee supervillains are forcibly drafted into an unwinnable battle – that screams cool. It’s a twist on the comic book picture we haven’t seen on screen yet, and bolstered by endless resources to achieve its wildest ambitions. Too bad, then, this movie’s feverish imagination mostly begins and ends with its flashy, gaudy costuming and temporary tattoo budget. If ever there was an opportunity to embrace the crazy this was it! Did we really need another generic “Stop the boring, vaguely defined villain from opening a sky portal!” story conveyed with all the live-wire energy of Batman doing an open mic night comedy routine? 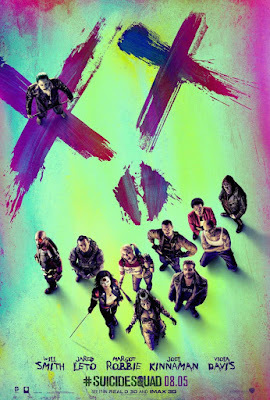 Speaking of ‘ol Bats, it’s no coincidence popular members of his legendary rogues gallery dominate, with assassin extraordinaire Deadshot (Will Smith) and vicious vixen Harley Quinn (Margot Robbie) sharing the limelight, and the Joker (Jared Leto) periodically popping in from another (hopefully better) movie to boost marketability. The film makes zero effort to convince us they’re on equal footing with their dastardly supporting colleagues, who run the gamut from mildly amusing cartoons – Aussie safe-cracker Boomerang (Jai Courtney), fire-shooting Diablo (Jay Hernandez) and sewer-dwelling reptile Killer Croc (Adewale Akinnuoye-Agbaje) – to bland half-finished sketches. No doubt team leader Rick Flagg (Joel Kinnaman), Enchantress (Cara Delevingne) and Katana (Karen Fukuhara) are fascinating on the page, but here? Not so much. And what’s the deal with Slipknot? Adam Beach’s baddie appears to have been purposely edited out almost entirely, indifferently announced mid-picture with a hilariously speedy bit of dialogue blatantly pasted in during post-production. So why has this insanely dangerous collection of psychopathic criminals with greatly varying abilities and powers been let out of their maximum security prison cells? 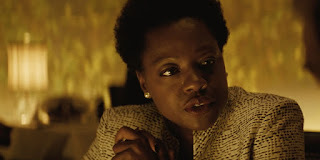 Because fearsome government agency head Amanda Waller (Viola Davis, voraciously chewing scenery and spitting out exposition with grim purpose) believes America needs a secret weapon to thwart the potential threat of a Superman gone awry. However, just as her initiative is uneasily approved, vengeful eons-old witch Enchantress - who has body-snatched innocent archaeologist June Moone - escapes and awakens her unstoppable brother Incubus in order to destroy humanity. With the apocalypse fast dawning, Moone’s disgraced soldier lover Rick Flagg is forced into action alongside his disposable “suicide squad,” who are equipped with failsafe explosive devices and more than a little resentful about it. 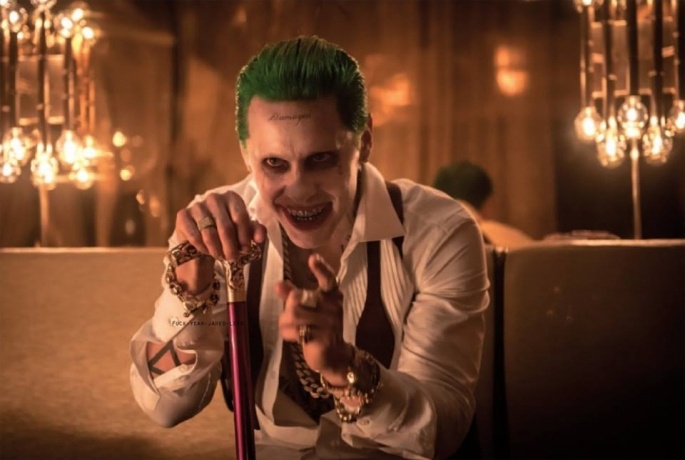 And, if the world being turned into a smoking husk wasn’t enough, ultimate wild card Joker devilishly schemes to free deranged girlfriend Harley from the clutches of justice. 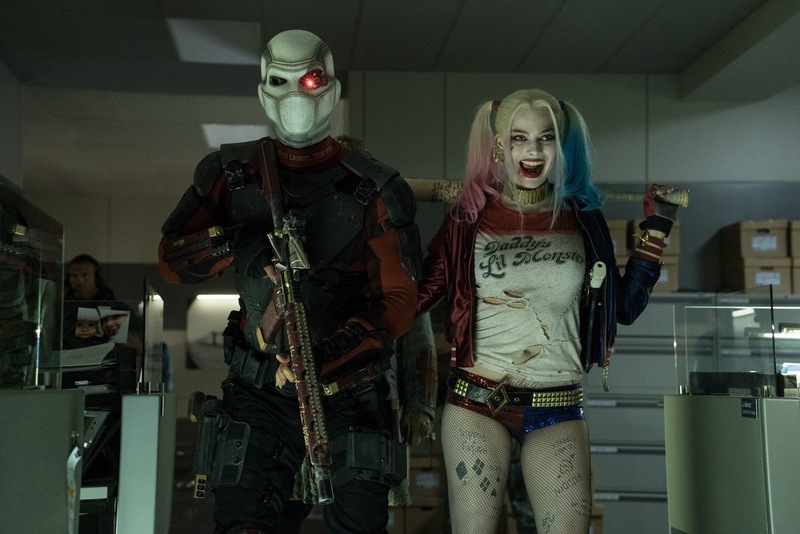 One can be wholly forgiven for expecting Suicide Squad to be brimming with confidence. Lord knows, the omnipresent advertising campaign has projected nothing but! In reality, though, the film – which was written and directed by End of Watch and Fury auteur David Ayer – clearly isn’t. At all. Over-edited and reshot to death, the finished product bares the sweaty handprints of countless execs terrified of dropping the ball in the wake of Batman v Superman. Characters are introduced multiple times, vanish completely from the picture only to reappear without mention, and are given big climactic emotional beats that land with a thud due to their arcs being cut to shreds. The sporadically engaging first act is almost daringly unhinged; an extended series of mostly disconnected montages scored to a parade of idiosyncratic song choices, hastily scotch-taped together by Viola Davis voiceover. It’s something to behold certainly, and at least hints at a level of manic weirdness that never arrives once the central plot kicks in. Given how visibly compromised Suicide Squad is it’s not fair to solely blame Ayer for how rudderless and incomprehensible the whole endeavor is. The film can’t even properly explain why Amanda Waller would form the group, given she’s friendly with Bruce Wayne (Ben Affleck) and other formidable heroes are shown to be active. More frustrating is the complete lack of tension and momentum in the plot. There’s no ticking clock and no compelling stakes to drive our antagonistic protagonists forward. You can feel the energy slacken as they wander aimlessly from one uninteresting fight scene to another without a clear mission objective, occasionally interrupted by talky diversions and unnecessary Joker business (the majority of Leto’s scenes as the Clown Prince of Crime – now a glitzy, angsty Scarface-wannabe who’s too silly to be scary – could be easily removed with no ill effect). And yet, despite being a superhero spectacle lost cause, Suicide Squad gets two things very, very right; Deadshot and Harley Quinn. Every time Smith and the show-stopping Robbie – whose unqualified success as the fan fave villainess is slightly complicated by Ayer’s long-established misogynistic male gaze – are on screen we’re reminded we are in the presence of true movie stars. In a film over-burdened with dumb, empty posturing, they’re triumphant, exciting and hugely charismatic comic book translations that beg to be featured in a project deserving of their gifts. It’s a hoot to see them overshadow their underwritten co-stars and tangle (all-too-briefly) with Affleck’s Batman! Stop mucking about DC and get it done and done properly! Problem is Warner Bros. and DC aren’t exhibiting much interest in cultivating well-crafted star vehicles for their rich staple of icons the way Marvel nurtured Iron Man, Thor, Captain America and the Guardians. And so we’re left with empty bundles of convoluted connective tissue like this and BvS and expected to care about buying into future chapters. Franchise building only works when the foundation is strong, people. Forget Harley and Killer Croc, the real Suicide Squad is the studio exec team spending innumerable precious days of their finite lives anxiously cranking these artless, unremarkable things out to muted response.